Vita-D-Chlor is a more environmentally conscious method of dechlorination than traditional sulfur-based chemicals. Unlike sulfur-based compounds, Vita-D-Chlor is not toxic to humans or animals, nor does it deplete oxygen in treated water. Key benefits are enhanced environmental protection, operator safety and public acceptance. Vita-D-Chlor provides a safe and effective means of complying with EPA regulations for the dechlorination of water prior to flushing into streams, lakes and groundwater. A number of dechlorination equipment systems are available for use with Vita-D-Chlor to effectively and instantaneously remove chlorine without causing environmental problems. 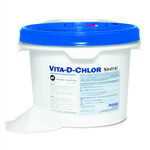 Vita-D-Chlor Granular is suitable for most applications of potable water and many super chlorinated applications as well. A feed solution up to approximately 10% can be made in the field with cold water and simple mixing. When properly dosed for water with less than 3 ppm chlorine, there is no effect on the pH of the discharged water. Vita-D-Chlor Granular is the most cost effective of the Vita-D-Chlor products and can be accurately dosed by using a venturi device or metering pump. 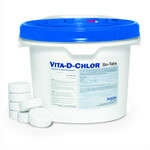 Vita-D-Chlor Neutral has all of the dechlorination benefits of regular Vita-D-Chlor, plus a few more. It has four times the solubility and is pH neutral in all concentrations. Vita-D-Chlor Neutral can be used to make a more highly concentrated feed solution than original Vita-D-Chlor. It is the preferred product for treatment of highly chlorinated water and is also widely used just for its increased solubility. Vita-D-Chlor Tablets are most commonly utilized for hydrant flushings. Tablets can be held in a 'sock' or 'mat' with pockets and then laid within the flow stream. They can also be used in a dechlorination device/diffuser where they offer fast, easy dechlorination at the hydrant. Tablets are also well-suited for chlorine neutralization during line flushes or emergency main breaks. They are completely water soluble, leaving no residue behind. They are also fast-dissolving and can accommodate a high volume of water over a short period of time. Developed for applications where a slower dissolving tablet is desired, Vita-D-Chlor Slo-Tabs dissolve at a rate about 7–10 times slower than our standard tablets yet use the same safe Vitamin C chemistry as all Vita-D-Chlor products. Initially developed for auto-flushers, their slow dissolving time and safe chemistry make them well-suited for unmonitored flushings.